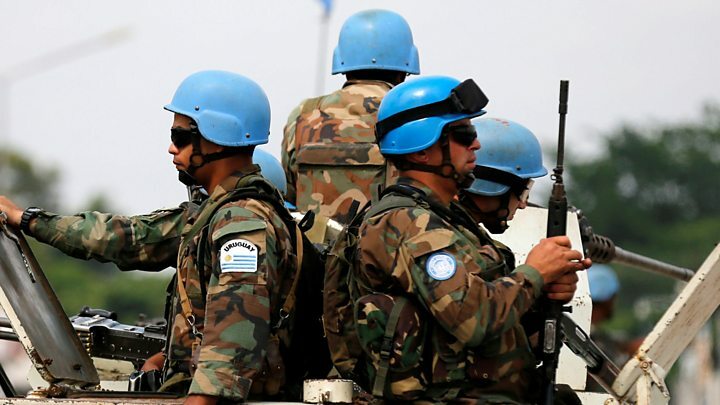 The UN's Monusco mission said the peacekeepers were attacked by suspected rebels of the Allied Democratic Forces (ADF) in North Kivu province. UN Secretary-General Antonio Guterres said it was the worst attack on UN peacekeepers in recent history and amounted to a "war crime". "I want to express my outrage and utter heartbreak at last night's attack. There must be no impunity for such assaults, here or anywhere else," he said. "This resulted in protracted fighting between suspected ADF elements and Monusco and FARDC [Congolese] forces," it added. The head of Monusco, Maman Sidikou, said: "I condemn in the strongest terms this deadly attack on United Nations peacekeepers and the FARDC. Monusco will take all actions to ensure that the perpetrators are held accountable and brought to justice." Tanzanian President John Magufuli said he was "shocked and saddened" by the news. Monusco is the UN's largest and most expensive peacekeeping operation and has been in operation since 2010. The Norwegian Refugee Council's DR Congo director, Ulrika Blom, described the situation as "a mega-crisis". "The scale of people fleeing violence is off the charts, outpacing Syria, Yemen and Iraq," she said. The UN base was allegedly attacked by the Allied Democratic Forces - a militia whose roots are in Uganda but which now ranges across the borderlands between the two countries. The group is described as Islamist but, as with most of the groups in this area of great poverty and perpetual instability, motivations for attacks can be more varied than purely sectarian. Conflict in Congo has continued to displace hundreds of thousands of people with violence erupting in different provinces - from the long running strife in the east to more recent conflagrations in Kasai and Tanganyika. President Joseph Kabila has refused to step down despite completing the two terms in office allowed under the constitution - though elections are promised next year. Amid the growing tension the UN has just under 20,000 troops in a country two thirds the size of Western Europe. 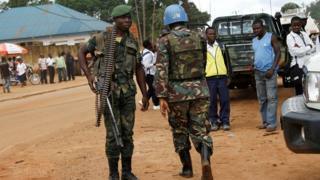 And even this force is being cut back as the US seeks to reduce the UN peacekeeping budget. DR Congo protests: Why have they erupted?